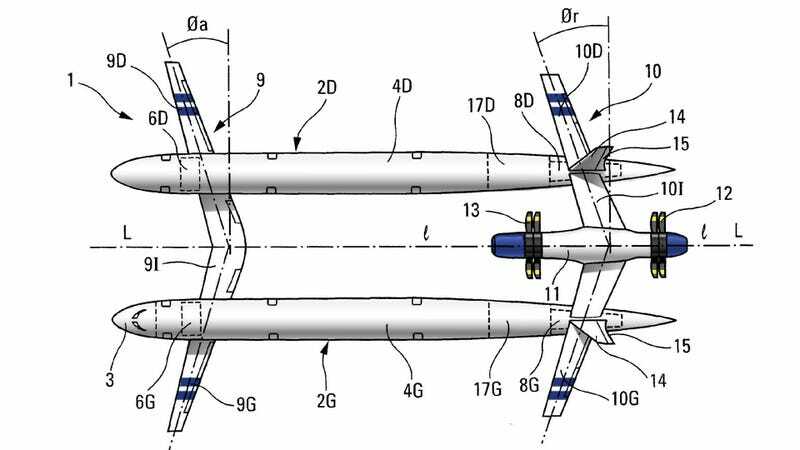 If you thought that the monster Airbus A380 wasn't crazy enough, you have to check out their latest design, which just got awarded a patent by the US Patent and Trademark Office. The "double fuselage aircraft" designed by Airbus uses turboprop propulsion to reduce fuel consumption, as well as a twin forward-swept wing configuration. Combined with the double fuselage, the twin wing will decrease structural weight. The logic is that it will reduce wing bending moment, which requires less structural support. Less weight also means less power and less fuel consumption.